The entire sale price of these artworks will be donated to the ACLU to aid in the protection of all people in the US from the unlawful actions of the coming administration. Donating artists have graciously agreed to sell their works for a fraction of their retail price and are absorbing the cost of shipping in the continental US. I am contributing to this event, thanks for your support and lets get to work. All components will be incorporated into InEarth, a sculpture soon to be on view in Ruptures, an upcoming group exhibition at the Des Moines Art Center (IA). Courtesy John Michael Kohler Arts Center/ Kohler Co. Her work explores aspects of material culture through still lives, site-specific installations, and photographs. The hand-sculpted glass compositions are comprised of inanimate objects that are metaphors for individuals and society. Every object, whether broken, flawed, or perfect is incorporated into the final composition, literally capturing a moment in time. The process of creating defines the final composition. Concepts of mortality, consumerism, materiality, and temporality (critical issues since the inception of the still life tradition in the 17th century) continue to be relevant. Free in honor of the 50th Anniversary of the Docent Council of the Fine Arts Museums of San Francisco. No reservations required. Sarasota, Fla, January 2016—As a sign of dedication to glass as an artistic medium, The Ringling recently acquired Sideboard with Blue China, a monumental and intricate wood and glass sideboard by renowned American artist Beth Lipman. This acquisition was made possible by a major gift, along with an endowment for the acquisition of contemporary art, from Dan Denton, Board member, The John and Mable Ringling Museum of Art Foundation, and Founder Emeritus, Sarasota Magazine. The work will become a part of The Ringling’s glass collection to be housed in the recently announced Kotler-Coville Glass Pavilion, set to open in the fall of 2017, made possible in part by major gifts by Nancy and Philip Kotler and Margot and Warren Coville. Montgomery, AL, Monday, December 21, 2015- The Montgomery Museum of Fine Arts is pleased to announce the acquisition of a sculpture by Wisconsin-based artist Beth Lipman (American, born 1972). 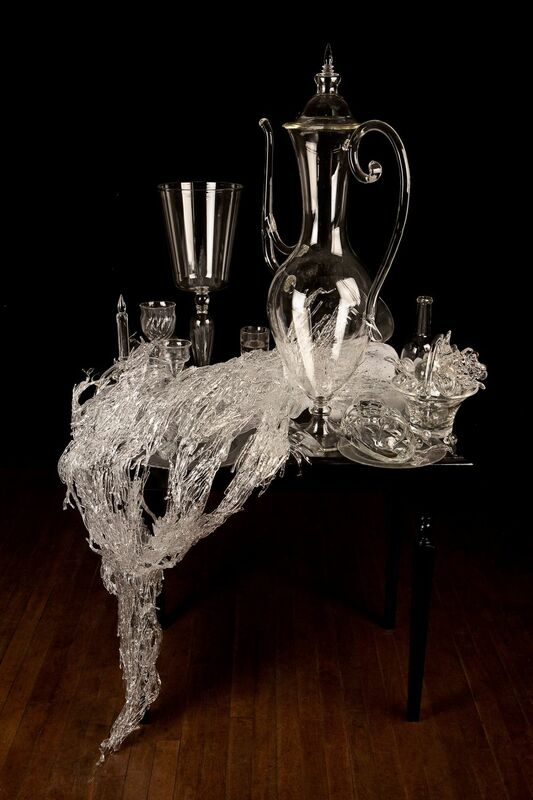 Pitcher with Vine, 2011, was created using glittering glass. This large-scale, three-dimensional still life references early examples of seventeenth-century Baroque still lifes—specifically the Dutch Haarlem style of traditional laid tables while addressing issues relevant to today such as consumerism and excess. It was purchased for the Museum’s collection using funds from the Collectors Society and through the generosity of individual patrons Dr. Laurie Weil and Dr. Tommy Wool, Corinna and Barry Wilson, James W. Wilson, Jr., and Wynona W. Wilson Family Foundation, Karen and Marvin Campbell, Laura and Barrie Harmon, Ann Hubbert, Joan Loeb, Laura and Michael Luckett, Dawn and Adam Schloss, and Helen Till. The sculpture is on view as part of the exhibition Once & Again: Still Lifes by Beth Lipman until January 31, 2016. It will then travel to the Hunter Museum of American Art in Chattanooga, Tennessee. In the summer of 2016, it will return to the MMFA for installation with other works from the Museum’s permanent collection.